Reginald L. Robinson is the Vice Chancellor for Public Affairs, and a Professor of Public Administration at the University of Kansas. He previously served as the Director of KU’s School of Public Affairs and Administration. He also served as a faculty member at both the KU and Washburn University law schools. Robinson is a Fellow in the National Academy of Public Administration, and a member of NAPA’s Board of Directors. He was Chief of Staff for KU Chancellor Robert Hemenway before serving for ten years he was the President/CEO of the Kansas Board of Regents. For five years he worked in Washington, DC at senior levels in the U.S. Justice Department, including as a White House Fellow assigned as Special Assistant to Attorney General Janet Reno, Deputy Assistant Attorney General (Office of Justice Programs), Deputy Associate Attorney General, and Acting Director of the Office for Victims of Crime. He earned Bachelor of Arts and Juris Doctorate degrees from KU, where he was also Student Body Vice President, and Editor in Chief of Kansas Law Review. Between college and law school, he served four years as a field artillery officer in the United States Army. He is also a founding member of the Kansas Leadership Center’s Board of Directors. He and his wife, Jane, a professor of nursing at Washburn University, have two adult daughters, Clare and Paige. While those who seek to exercise leadership from positions of authority often benefit from that status in many important ways, that formal positioning can also impose meaningful constraints that complicates efforts to lead in a manner that reflects important adaptive leadership principles. 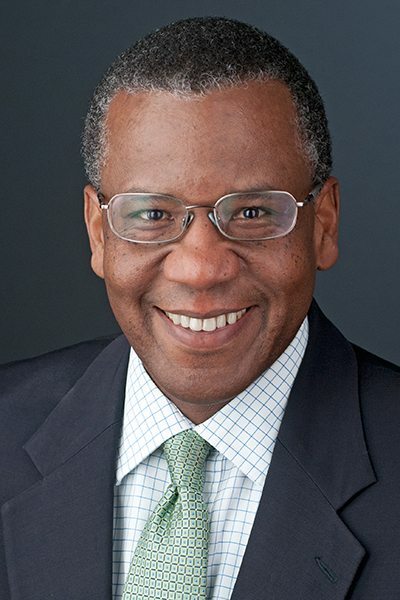 Drawing on his own leadership experiences and reflections, Reggie Robinson will share his perspectives and lessons-learned for how to effectively confront the challenge of the flip side of authority. He will consider these, and related issues through the prism of some key KLC leadership principles and competencies.